From 1348 to 1460 Mystras became the capital of the Despotate of Morea. The despotate was the expression of the relative desire for decentralization of the Cantacuzenes (1348-84) and the Paleologi (1384-1460), who, according to a system modelled on feudalism, conferred power to family, in most cases to sons or brothers. During this period - the zenith of Mystras, when the Peribleptos and the Pantanassa were built around 1350 and 1428 respectively - the cosmopolitan city was a major piece on the political chessboard on the Mediterranean. Most of the despots married Frankish princesses; some made necessary alliances with the Turks, others with the Venetians. 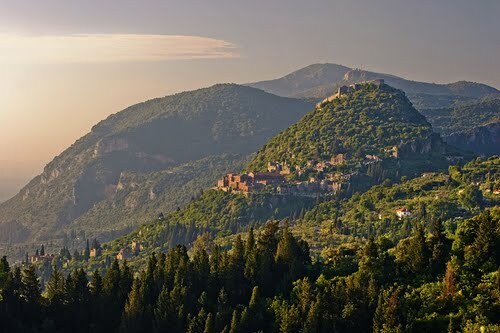 In 1402 Theodore I Paleologus sold Mystras to the Knights of Rhodes; only the hostile reaction of the population forced him to cancel the transaction. After paying a tribute to Murad II at the time of his victorious expedition in 1446, Mystras fell to Mohammed II on 30 May 1460. The event was seen in the West and in the East as being almost equal in importance to the fall of Constantinople in 1453.